Like many, the first time Contaldo came to my attention was as the eccentric mentor to Jamie in the Naked Chef. Unbeknownst to me he moved to the UK in the late 60’s, worked in Carluccio’s restaurant and published numerous books. These guys clearly go waaaaaay back. Carluccio OBE is a legend. Looking increasingly like Barry Cryer, he’s like an adorable grandad getting a bit tipsy in the corner. 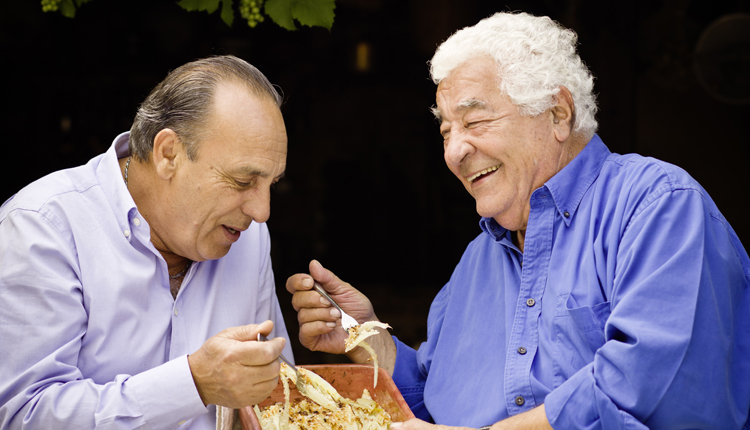 Seeing these elder statesmen play around on an old train carriage recounting their packed lunches was fantastic as was their attendance at a local christening (where Carluccio was caught resting his eyes for a moment or two) and Contaldo’s dip in the ocean – trousers rolled up, socks still on. Recipe-wise the orange rice cake and fish stew looked glorious. The series definitely benefits from there being two of them (as mognellagnawson discusses) which is something Raymond could’ve done with – his junior chefs didn’t quite cut the moutarde de Dijon. love the Barry Cryer comment! I’m really enjoying your blog and have nominated you for the Kreativ Blogger Award – just follow this link – lucysfriendlyfoods.wordpress.com/wp-admin/post.php?post=925&action=edit&message=6&postpost=v2. I know it’s a bit of a chain letter but hopefully it’ll bring in more readers! Enjoyed reading your analysis of two lovely Italians. I will have to see if I can find more information on it as it sounds wonderful based on your description. Thanks!